Duplicated copies of Ricker Reader, (1953-1982), including Ricker Notes, (1982-2004), the Department of Architecture paper, edited and published by Architecture students with faculty advisor and including feature articles, news, poetry, drawings, book reviews and quotations. Of special interest are articles on graduate study and Louis Sullivan (March, 1964). 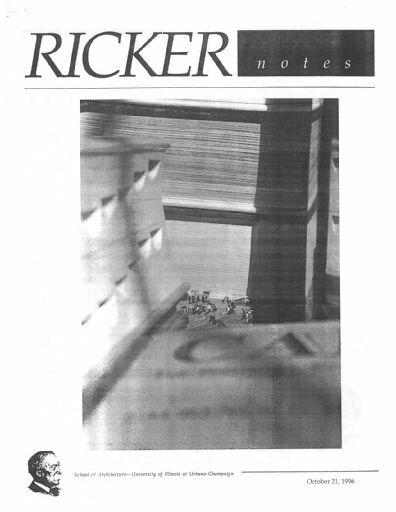 The Ricker Reader/Ricker Notes (Digital Surrogates) are managed by the University of Illinois Archives and do not feature precise descriptive information for each item. Discover their contents by browsing the folders and files. For more information, contact an archivist at illiarch@illinois.edu.